This size Luffa is cut in 7/8 inch slices and is ready to be embedded into soap! Use this natural exfoliant to create your own pedicure soaps or exfoliating bars! 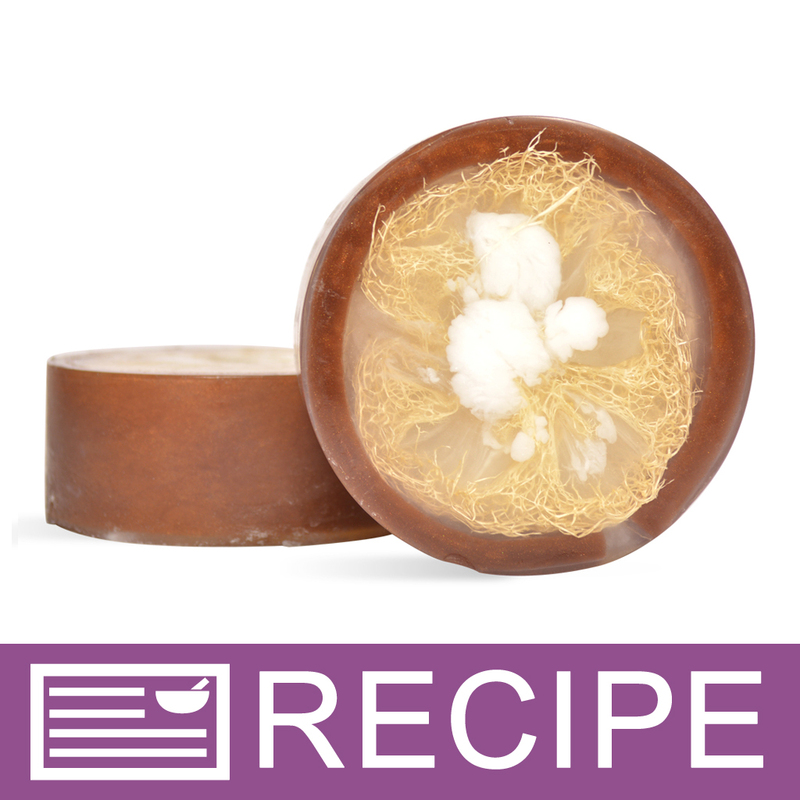 Cosmetic Loofah is perfect for pampering pedicure bars of soap. Once the gourds have matured, they are picked and allowed to dehydrate for over 6 months. The remaining insides of the gourd plant are cleaned and sold to the cosmetic industry as loofah. Loofah is considered an all natural exfoliant. The loofah that is 7/8 inch thick has been pre-cut to this size. This size is a perfect size for embedding into a bar of soap. Color and exact size may vary depending on crop and farm. 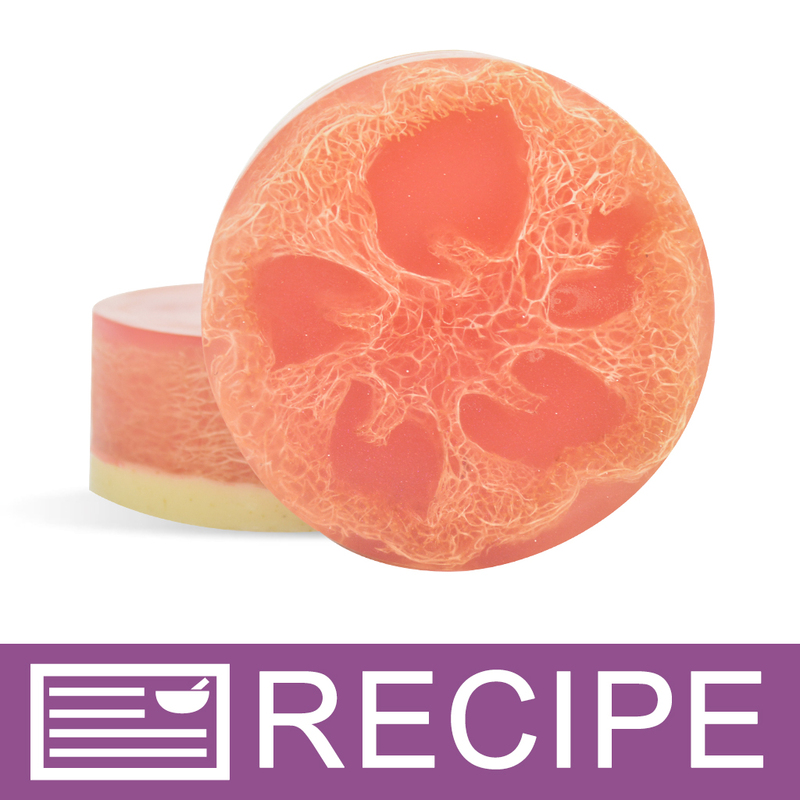 To embed luffa into a bar of soap, place luffa slice in desired mold. Pour melted mp soap or cp soap over the luffa and completely fill mold. Unmold soap when hard. COMMENTS: I have been buying the whole loofahs and cutting them myself. These babies are such a time saver. COMMENTS: These work wonderfully in my soaps. Sometimes I have to cut them in half, but that's not a problem. Exfoliates your skin nicerly in the soap bars. COMMENTS: I was excited to see WSP carry these and had to have them! Where I live Luffa sponges are hard to find so I have to order online. Not always getting what I expected(If you know what I mean) these looked uniform in size and color and the plus was "precut to size" YAY that's a time saver!! Because the actual natural sponge tapers they are not all completely uniform in size, However they are very close! Great product will purchase again and again! COMMENTS: These are prett6 hard no give at all, I make loofah soaps, these are very firm and hard , doesn’t do any good to soak them as I have others. 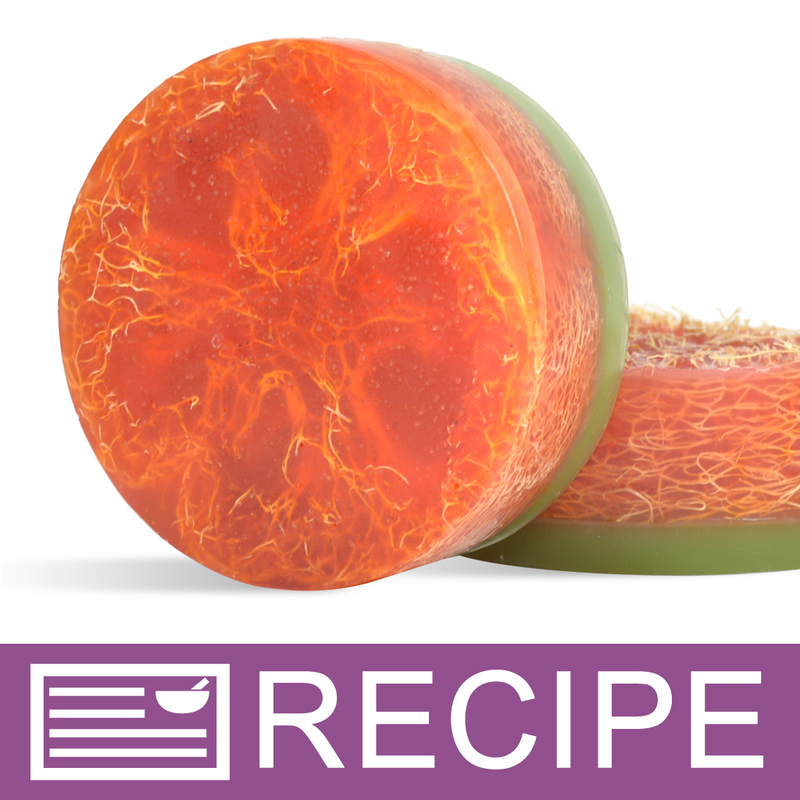 COMMENTS: My customers love the luffa soaps and I love the convenience of these pre-cut slices. The price is great, too! COMMENTS: These are the perfect size for my mold.Have already had a few people want soap with these in it. 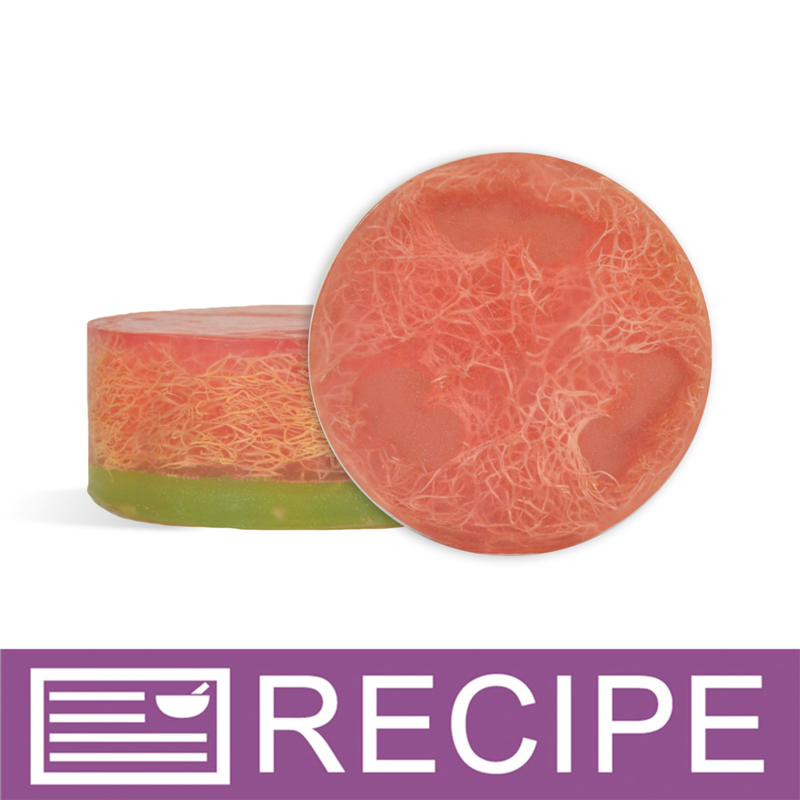 "Luffa used in M/P soap"
"Luffa soaps are a no-brainer." COMMENTS: People love them in my shop! Always sell out. Rated very good because it would be great if the diameter size was consistent. Other than that they're perfect. "Crafters Choice™ 7/8 inch Luffa"
COMMENTS: Great size. I use this in Pedicure exfoliating bar. Positive customer feedback. COMMENTS: they fit perfectly in the soap tray. COMMENTS: I put these in the basic square mold to make exfoliating soaps. My male customers especially like them! COMMENTS: They are nice, but too big for the molds I have, I will have to order smaller ones or a bigger mold. COMMENTS: I love these loofah slices. They work well in my silicone crafter's choice molds and make a great looking soap bar. COMMENTS: These are larger than I thought they would be, but I was still able to fit most of them into my round mold. Out of the nine that I ordered, three had a diameter larger than 2.5". Still would buy again. COMMENTS: I have used this only in melt and pour soap so far but I really love these in my soap. They are super scratchy and they feel really good. They really exfoliate your skin. COMMENTS: The length does vary but the thickness is perfect for my foot scrub soaps! Also, PERFECT soap dish! "Great product and nice size." COMMENTS: I used these in my loofah soaps and they were great. They are a nice size and fit in my round disk soap molds with just a little squishing. They made very nice soaps and we're easy to use. Will definitely order again! COMMENTS: I really like these loofahs. Great size! COMMENTS: I use these luffa slices in gift baskets and in cold process soap luffa bars. I like this larger size for the basket as they give it a nice rustic look. COMMENTS: These are great for making luffa scrubby soap bars. All the slices were nice sides will order again. COMMENTS: Great for melt and pour soaps. Love how exfoliating the luffa is in when embedded in melt and pour soap. COMMENTS: These are a great price point and quality luffa. 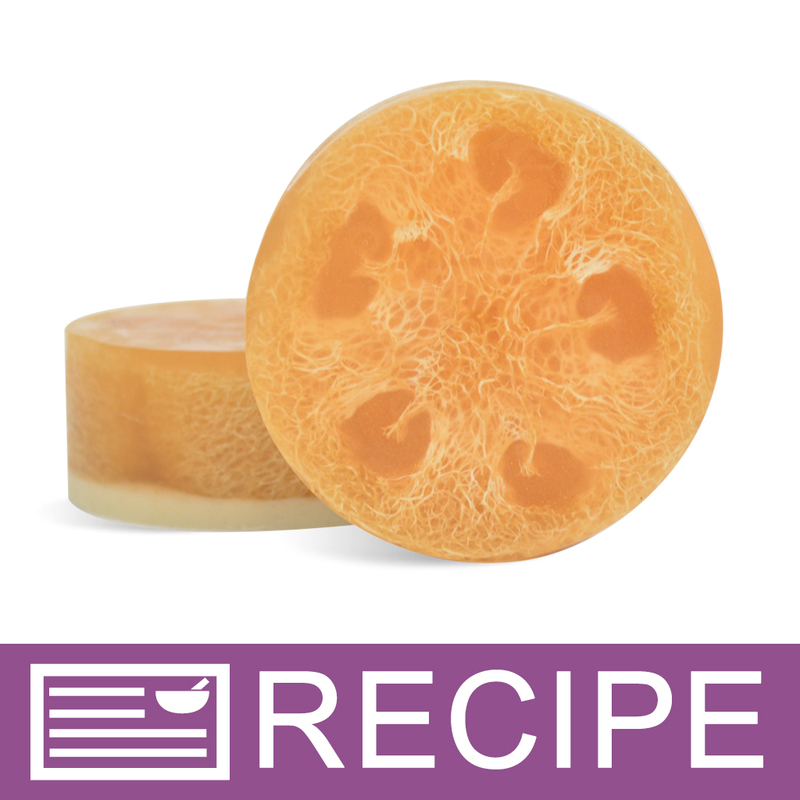 Perfect for luffa soaps without the mess of cutting!!! COMMENTS: These fit perfectly in my round melt and pour molds for my exfoliating soap bar. COMMENTS: fit perfectly in my loaf molds. COMMENTS: Great quality luffas, perfectly cut! COMMENTS: WSP took the work out of creating pedi soaps & exfoliating soaps. They are the perfect size, best on the market in price, size and quality. They are my no# 1 sellers! COMMENTS: I love these slices! Using them for cp soap. COMMENTS: These were a good value. Unfortunately, my soap seized and did not totally encompass the luffa, as was the plan. They were easy to work with and didn't have a lot of seeds or junk that had to be cleaned out of them. COMMENTS: Love these! I love hoe they come presliced...fit perfect in the regular circle mold! Very easy to work with and my customers love them. COMMENTS: Very nice luffas. I was very happy with the sizes I got. They were consistent so my luffa soaps turned out nice and sold better. COMMENTS: Great for individual melt and pour soaps. COMMENTS: I ordered 24 of these pre-cut luffa sponge slices to use inside the basic 3" round silicone mold. Most of them fit perfectly. A few are too large but I can either use them with another mold, or- I think- wet them , fit them inside the 3" mold and allow them to dry before pouring liquid soap over them. They are a little more expensive than buying whole sponges and cutting them myself, but SO much easier ! COMMENTS: We have ordered over 1000 of these and some are REALLY small. Lately more have been in the 1 inch wide range in 25% of the batches and we can't really use them. Would be great if they had a "small" size then a close to 3 Inch size as it becomes wasteful. 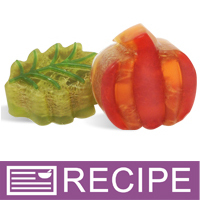 COMMENTS: perfect for my tomatoe soaps, but I did cut them each into two pieces because they were to thick for my mold. COMMENTS: I was cutting up a loofah before, but these individual loofahs are exactly what I needed tor my melt and pour loofah soap. They fit perfectly in the mold I also purchased from the site (Crafters Choice™ Round Basic Silicone Mold 1602). Highly recommended! "Super easy to use & clean." COMMENTS: The luffa pieces I received were very clean, and a good range of size. I look forward to making round luffa soaps. I just soak briefly in water, shake off the extra water and they form into the mold really well!I used them with CP soap at a thin trace, taping the mold to make sure the luffa was fully filled. Perfect! COMMENTS: These are great luffas. my only complaint is that i wish the sizes were more consistent. I know they are natural but it'd be helpful if they were sold in bunches that had less variance. Like a small and a large bunch. COMMENTS: My husband loves when i embed them in his soap bars. Strong and durable, great even after the soap is gone! COMMENTS: I love how these are cut and look. They fit perfectly in my gift sets and add a spa touch to my photos . My massage customers love them and I run out very quickly. They have just the right abrasion feel and look even better as props for my products. Will be ordering again. COMMENTS: Loofah color was too dark. • Loofah color, too dark. "Fits perfect in the round molds"
COMMENTS: These fit perfect for making loofah soaps in the round molds. However I don't like getting more of the "teeny tiny" sizes in my bag, than the ones I can actually use. COMMENTS: I love that they are precut and ready to use which speeds up my production time. I love the different sizes, I use the smaller ones in my guest round mold for favors(wedding, anniversary, baby, etc). COMMENTS: I use these for my pedi soaps. I only gave them 4 stars just because they are not always the same diameter (sometimes off by a lot), so I can't always use every one that comes in the package because they are too small. The quality is excellent though and I will buy more just wish they were a little more uniform. COMMENTS: Found some from another company for half the price--but they were primarily half the diameter also. Will be sticking with the WSP ones from now on. COMMENTS: So handy having them pre-sliced. Makes a great pedicure soap. COMMENTS: These are great for loofah soaps or to include with your cream soap. COMMENTS: Clean and easy to use since it comes in slices, perfect for the CC large round molds. COMMENTS: They are a perfect fit for my glycerine loofah soap. A summertime favorite. "great amount, of all different sizes "
COMMENTS: The bag is full of great quality luffas but the circumference of them are all different. COMMENTS: Nice to have these pre-cut into the perfect size. COMMENTS: Works great with my soaps to add that extra cleansing power. COMMENTS: I love that it's already sliced! COMMENTS: A favorete with my customers. Great for scrubbing the dirt off your hands My machanics & fisherman customers come back for more! COMMENTS: These are so easy to use to make luffa scrub soap. 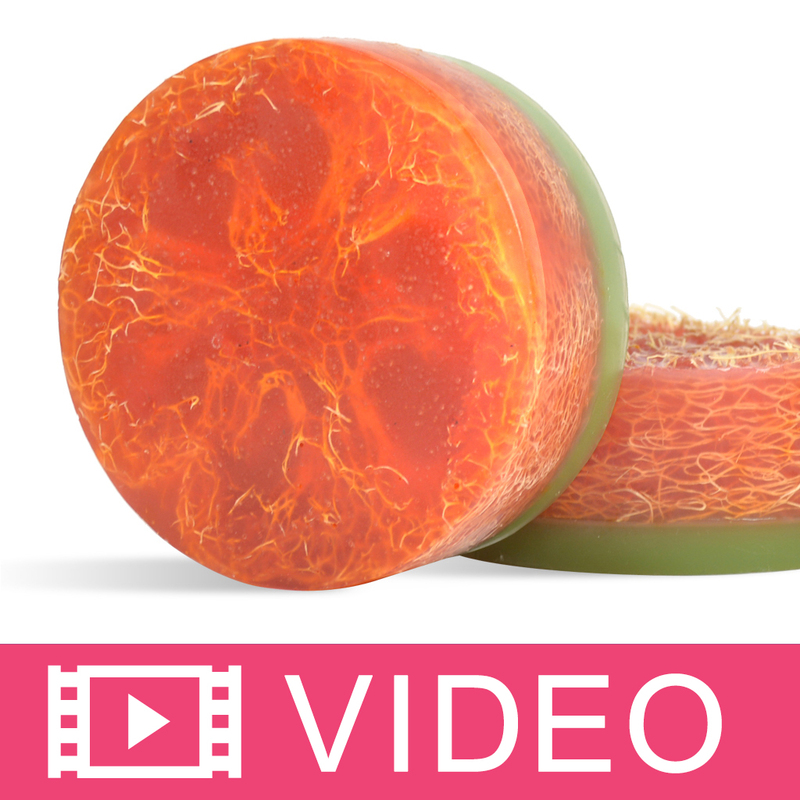 The precut slices are consistent in size and ready to use saving time. I have ordered these twice and will be ordering again in the future. COMMENTS: Overall the pieces are pretty large, which is great because the mold I bought to use with them turned out to be much bigger than I had anticipated. I worried I would need to cut them but nope, no adjustments needed; they perfectly fill the molds and look great. COMMENTS: I had never used a loofah before so I was a little put off by them. I thought they would be a hassle to work with because they look hard but once I got them and learned more about them I found that they were a little saver in a soap. My customers love them! The price is great too! COMMENTS: These worked out well in our scrubs. My only reason for only 4 stars, there is no consistent size. Some were just too small for our application. "Too large for round, silicone mold"
COMMENTS: These need to be a little smaller so they fit better into the round silicone mold. The soap does not fill in around the luffa and the bars end up with very little soap. Will not buy again. WSP Response: Luffas are a natural product that grows in a tapered shape that are skinny at one end and wide at the other. Therefore the diameter of the slices may vary greatly from one batch to the next. COMMENTS: I love using these little slices to make my Peppermint & Lavender Foot Scrubby soaps! • maybe a little more uniformity in size? COMMENTS: Makes a wonderful exfoliate. And is visually appealing when added to melt & pour soaps. "Great for embedding in M & P"
COMMENTS: I use these for my loofah soaps but many are still a bit thick and I end up having to cut them again. COMMENTS: I am in LOVE with these luffas and so are my customers! They fit perfectly in the circle silicone mold and the options are endless when it comes to making pedicure luffa soaps. Pair them with a bar of soap and you have the perfect duo to offer as holiday gifts. These are going to be a huge hit! COMMENTS: These work great and fit perfectly in the soap mold using your recipe for pedicure soap. COMMENTS: This loofah is not overly scratchy nor stongly scented.Its looks cute paired up with many different soap gift bags for both men & women. "looah soaps made with ease "
COMMENTS: I was very please with the 7/8 loofah's that I received. They work conveniently in my molds for my loofah soaps. The sizes do vary even with the 7/8 loofah's but they are easily manipulated for use in whatever mold is desired. I will definately purchase these again. They make loofah soaping easy. COMMENTS: Added these to the regular round MP soap mold and put them in the store.... sold out the first day!! People are loving them!! Thanks for a great recipe! COMMENTS: Not only are these great hard exfoliants but they are also easy to work with, and a look great too. On average they fit just right in the round silicon mold I used (I do believe it was 1601. I was surprised they didn't soak up the soap base much as well. Will definitely be getting more asap. COMMENTS: Nice product we use this in our melt and pour soap and the extras that are too large to fit in our bars we sell as a stand-alone item. Will purchase again. COMMENTS: I only gave it a 3 star rating because the pieces were not consistent in size. I ended up using one and cutting another piece in half to get the size I needed, for the Foot Scrub Loofahs I made. I will purchase the whole or 5 inch loofah next time and cut exact size I need. COMMENTS: I originally bought the pedicure kit using this luffa slice. My customers just loved them. They are a perfect size and does the job we have all come to love from luffa. I now make a soap bar using the luffa and have had really good reviews. COMMENTS: I love making my foot scrubbies with these, but wish the size of the pieces were more consistent. I don't like the look of having to cut down the very large pieces. But these are a really great product. I just may use the larger pieces in a full size bar and see what happens! COMMENTS: I used these luffas with the round 5 oz soap molds (also from WSP) and I am very happy with the finished product. The luffas fit perfectly in them and I am able to fill it with my M&P soap base very easily. I will definitely continue to purchase these for my luffa soaps! The only thing I would change would be to make all of the luffa pieces consistent in each shipment. WSP Response: Since this is a natural product, it is nearly impossible to make each groud grow identical in size. Great suggestion otherwise! COMMENTS: I used these loofa slices suspended in honey soap. Wonderful! It is a little rough when it can't get really wet enough but that makes for a great exfoliant. COMMENTS: The quality of these is wonderful. Outside of several pieces being quite small, I will order again. COMMENTS: Perfect. Use these when I make my Soap Scrubbers, and everyone loves them. COMMENTS: I used this in my MP soap. What a hit and I sold out. It took me a while to use them I cut them in half and put inside of my square molds that I brought from WSP. OMG. You have to try it. I recommend this product. COMMENTS: I bought these for the first time to make loofah soap. Approx. 70% of the loofahs will fit in the round 5 oz. soap molds. The others are too large so I cut them in half and still use in the round molds. I use a clear melt & pour soap with a small amount of color and they look really cool ! COMMENTS: Product was a bit of a surprise. Size of pieces was not consistent. COMMENTS: You're skin will love you for the all natural luffa exfoliating they offer! COMMENTS: I was so happy to get these sizes. I have been cutting the larger ones down and this is so nice. They fit in the mold and are ready to go. This is a great time saver. And even though they can't all be the same size, most of mine were pretty much in the same size better than me trying to cut them. COMMENTS: I wasn't sure about this product at first. I sell them as a foot scrub with soap poured into them. After much thought I am going to start purchasing them from WSP, because they are more flexable and they can be squeezed into the mold easier. COMMENTS: They were a nice addition for a spa type bar. they were the perfect shape to fit into a basic 3 ounce round mold. I will be using these again! "so glad i found these!" COMMENTS: whoever thought of this product should get a medal! its such a simple idea, placing a slice of luffa in a bar of soap, turning it into the perfect foot scrubbie. my customers love the simplicity and the attractiveness of the finished soap scrubbie bars and i hope you never stop carrying these! COMMENTS: I love using the luffa in soap making. Great for using with left over soap. I wish they sold rope so we could make soap on a rope with them. COMMENTS: I use these for my loofah soaps...can fit several in a bag, great product! COMMENTS: These are a perfect size and great addition to melt and pour soap. They look neat in the middle of soap and are also effective. I love that they are already cut also. COMMENTS: I love these little luffa's for my melt and pour soaps. I put a piece in each guest bar I make and my customers love them! Great seller! COMMENTS: This is great and saves time for embedding into soap. I sell out of my luffa embedded soaps all the time. I can't keep them. COMMENTS: These are the perfect size for use in the Basic Round mold. Even the larger ones can usually be squished down to fit. 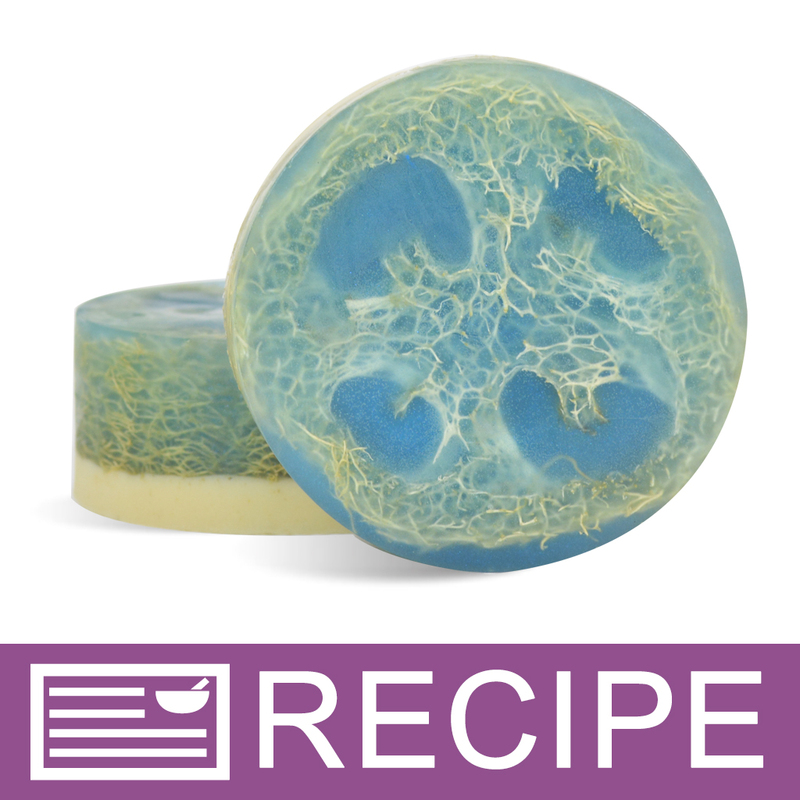 Customers love the idea of having a luffa embedded in their soap. COMMENTS: I love the loofah, I put it right in with my foot scrub bar and my customers love it. It has a great price and has been a great addition to my product line. COMMENTS: These little slices are perfect for placing under a bar of soap to keep it dry. My customers love these as do I! COMMENTS: I tried WSP recipe idea for pedicure bars. They turned out great thanks to this luffa. Each luffa slice was a different size. At first I didn't think it would be rough enough to use on your feet but they are. In fact I ran out if sugar scrub and tried to use the luffa soap on my legs. It was super rough and didnt feel too good so II don't recommend using it on freshly shaven skin! By the way, the pedicure bars are a huge hit! COMMENTS: These were the perfect size for our melt and pour soap. We sold out of this in no time. COMMENTS: These are the perfect size and shape for foot scrub soaps. My customers love these and its perfect to have them in exactly the right size. You can't go wrong when you buy this product. COMMENTS: This product is great! Each Luffa in the bag was very close in size, which worked great. I use this product to make Luffa Exfoliating Soaps. I add one Luffa per bar of soap. These Luffa's can be used whole, cut in half or shredded. Item comes in a re-sealable bag, which makes them easy to store. As always my order arrived quickly and in great shape. Love this product and love the price. Wholesale Supplies Plus is reliable. 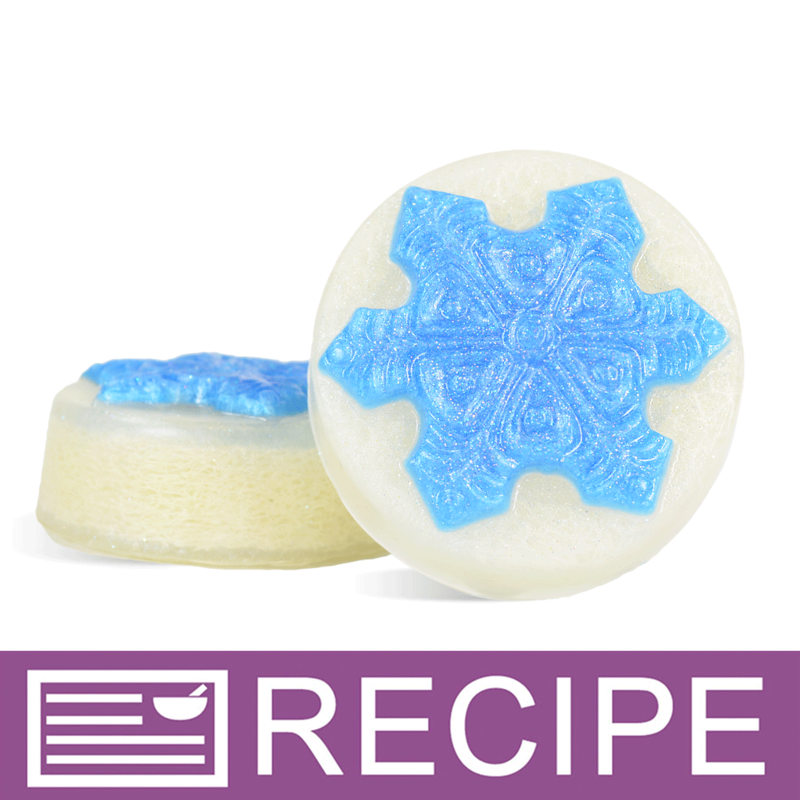 COMMENTS: I made your pedi soap from your idea page and I love it works great and looks so pretty. COMMENTS: These luffa slices are awesome for using with melt and pour soap to make pedicure soaps. I add peppermint essential oil to the m&p base and they sell like hotcakes - especially during the summer when everyone wants their feet to look their best for flip flop weather! COMMENTS: I sell loofah soap year round and I buy these from WSP. I use the round crafters choice mold and put my loofah in there and pour my melt and pour over it. It's so easy and my customers love them. The only down fall is you never know what size you will get when you order them sometimes they are really small. Just ordered more today-very good seller! COMMENTS: These are a much have! I use these in Pamper Me Pedicure (recipe) a product which sells itself time and time again. These pre-cut pieces certainly speed up production when compared to cutting from the 5" or 10" luffa! COMMENTS: I ordered a few of these to try. I made a mango fragrance using Wholesale's glossy round silicone mold. I'll definitely be ordering more. Customers loved this product. "Love these pre cut luffas!" COMMENTS: These pre cut luffas make it all the easier to make my luffa soaps! COMMENTS: I love that they are already cut! I use these in a couple of different soaps and my customers love them! COMMENTS: I embed these in soap, kind of like the kits sold here, and they are quick sellers. Everyone loves these, including the guys. They aren't only great for feet, but also just as a general body scrub. Every order of these I have gotten have been very nice. Simply a must have! COMMENTS: Looks great in soaps. Size does vary a lot tho...But looks great and sales great! What more could you ask for? COMMENTS: This luffa is great for use with the Crafter's Choice round mold. I think my customers are going to fall in love. MUST BUY MORE LUFFA! COMMENTS: My specialty is herbal soaps made with the all-natural MP soap base. We either raise all of our herbs or buy them from local gardeners/farmers. We cannot raise enough gourds for our scrubbies here in west central Ohio, so I cannot thank you enough for sourcing these from American farmers rather than relying on cheap imports! This is an important buying point for me and selling point for my clientele. Thanks again! "LOVE, LOVE, LOVE THIS PRODUCT!!!" COMMENTS: I make my soaps in 5lb block wooden molds and used the larger loofahs in them and about 1/3 of the loofah sticks up like a handle and I drizzle some of the soap over the loofah. They turn out to be about 8oz Bars of soap and the smaller loofahs I do the same with in a 3lb wooden mold and they come out about 4.5oz bars. They are beautiful bars of soap! I will be ordering more very soon! COMMENTS: One of my top selling items. These are beautiful in a bar and are quite addictive once you use them. My customers can't get enough! COMMENTS: I've used a bigger cup to fit these loofah instead of a standard size mold. It comes out well and I used the oatmeal soap base with added F.O. Good seller for me. "I've read that some recipes require you to "hydrate" the luffa so it swells before you cut it and put it into the mold before pouring your soap. Is that necessary for MP and the round mold I'll be using?" Staff Answer We have not found it necessary to do that. We simply place the luffa slice in the mold and pour the MP soap over it. "What is the country of origin please?" We have multiple suppliers and there is no way of knowing where each individual Luffa originated. "would i be able to use these in hot process soap making? Thanks Tracy"
I have never had a problem with using them in cpop. They seem to stand up to the 170 degree oven and the high gel phase. 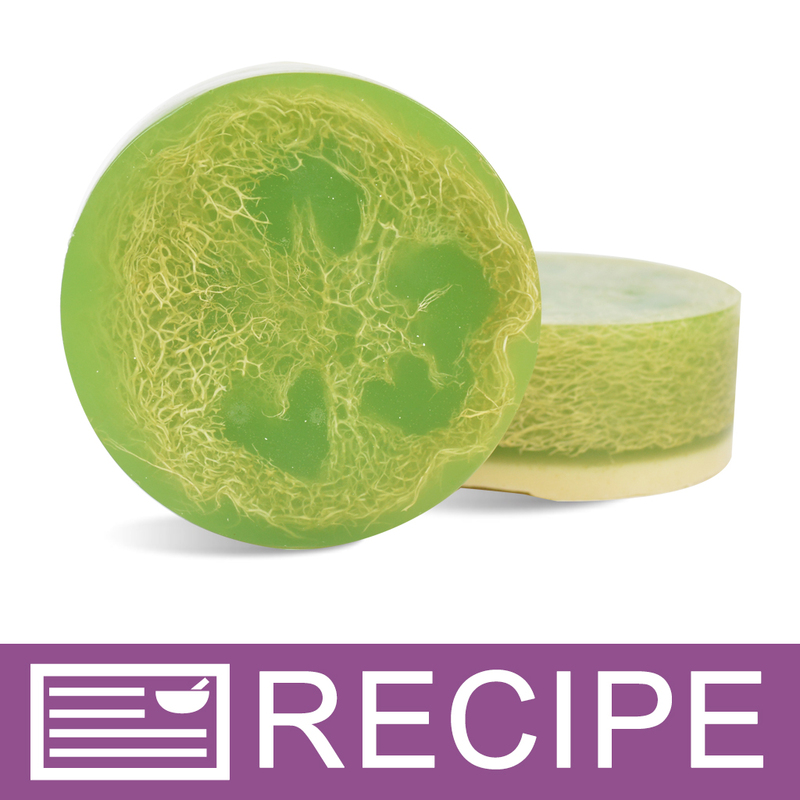 "What is the best way to add luffa to a log of cold process soap, so that it doesn't introduce too many air bubbles? Any tips?" Staff Answer Many people stand the luffa up in a plastic bag (the kind a newspaper is delivered in). Then pour soap slowly into the luffa. This ensures all air bubbles can float up and release. In addition to other tips, pour at a very thin trace. You may not want to take a water discount on your luffa batches. "Hello, I know it says the size is 7/8, but I don't think that's the diameter is it? Can someone tell me about the diameter of this lufa? Would be even better if someone can give me measurement in centimeter"
Staff Answer With this luffa, the "7/8 inch" is referring to the thickness of the cut. As this is a natural product, the exact diameter will vary depending on crop and farm. The approximate diameter for one of these is usually between (but not limited to) two and three inches. "Are your luffa produced in the USA or are they imported?" Staff Answer They can be from either the USA or imported depending on the time of year (growing season) and availability of the product. "I have received some luffa pieces with seeds in them. I understand it is a natural product but are these still okay to use?" Yes, it's completely safe! Just don't rub seeds in your eyes or something. Yes. A luffa is actually a gourd-type squash that is dried and sliced to make these wonderful scrubbers. I usually just pick any seeds out before I add the luffa slice into whatever soap I am making, however, it will not hurt anything if they get left in your final product. "When using the Luffa in a bar of soap, as the soap is used, will it eventually shred or come apart?" Staff Answer Typically the luffa will stay in the entire round shape. Possibly with very aggressive use it could come apart - but this would be very unusual. It will stay the same in one piece. Unless you're making a good effort to pull it apart on purpose, luffa is really sturdy. I use these to make pedicure soaps, and even with the vigorous scrubbing of the feet they stay intact! Love them! The luffa itself should stay together throughout use, however, I would recommend discarding it once the soap is finished, as having it sit around in the moist damp shower can cause mold to grow.